Love history animals? This prehistoric shower nozzle shaped like a Tyrannosaurus Rex Skull will create some Jurassic fun. A terrific gift for kids and Dino Enthusiasts. Wash N' Roar. Shower time just turned Jurassic, a unique bathroom nozzle idea for kids who love history animals. 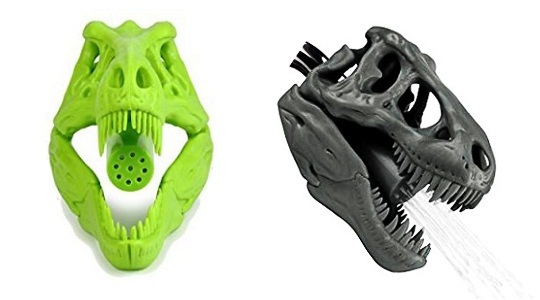 Modeled after a real Tyrannosaurus Rex dinosaur skull head, this awesome shower nozzle will give kids and kidults of all ages a great bath fun. It is very easy to install and maintain. All you need is to fit its adjustable wrench and Teflon tape. Just follow the instruction from manual and install this t-rex nozzle head instantly. Complying with the California water saver standard of 1.8 gallons per minute its a unique decor to your kid's bathroom. Add an amazing pre-historic touch to your home with this cool gift.